The primary goal of the Arizona State Climate Office is to provide information regarding the state’s climate in support of operational, educational, planning, and research endeavors. The various pages provide an introduction to the office, weather and climate data and information for Arizona and the southwestern United States, and guidelines for requesting additional information or data. Possible significant weather for today – Phoenix – with links to nearby NWS stations. Possible significant weather for today – Nationwide. 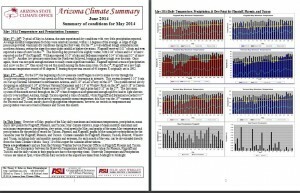 At the end of each month, the weather for that month is summarized in a publication that includes a narrative of the weather events across the state, graphs and maps including temperature, precipitation, dew point, and winds, as well as more specific data for Flagstaff, Phoenix and Tucson. 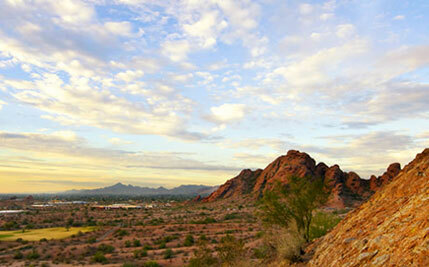 Join the citizen scientist precipitation network in Arizona. 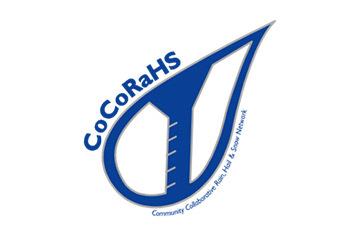 Measure precipitation in your own yard, report your values at the CoCoRaHS website. Click on the logo for more information. 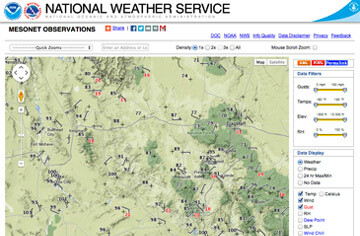 This link takes you to a map of current weather conditions for Arizona. You can click on a station and see complete current information for that station, and access archived data as well.